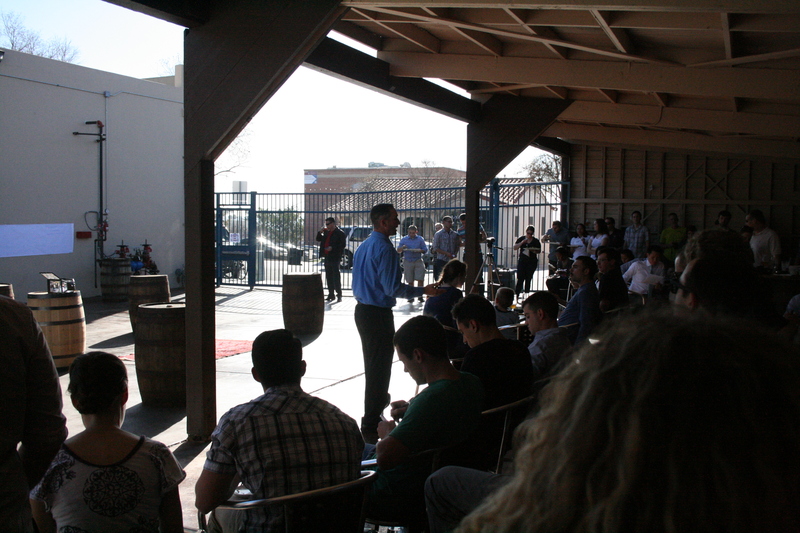 Last Thursday afternoon at Ballast Point Brewing’s Little Italy location, creative minds from across the Navy and Industry got together to share some big ideas. This was our fourth Waterfront Athena Event and we had our best turnout yet! 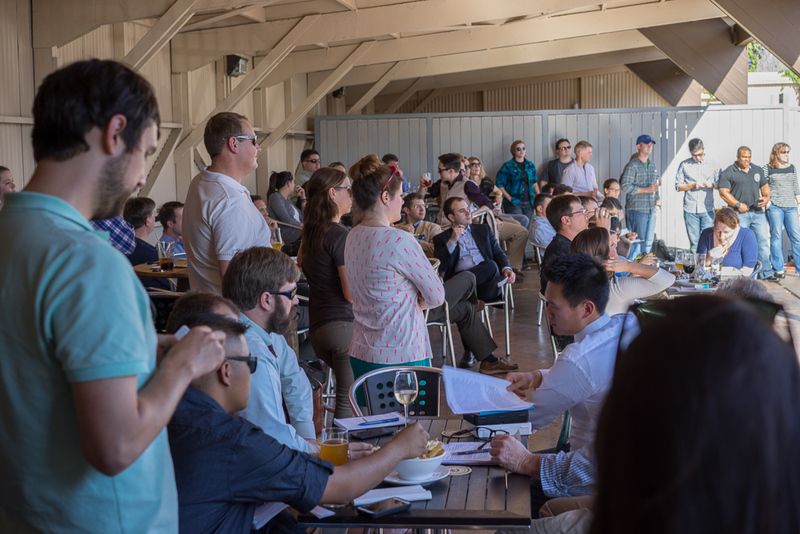 There were about 75 innovators in attendance in the San Diego sun, braving the elements (and the occasional noise of planes passing overhead) to hear nine presentations aimed at making the Navy better. For a quick rundown of how Athena works, check here. From the Navy side, 20 commands were represented, including the Chief of Naval Operations’ Rapid Innovation Cell, a cadre of young Sailors and junior officers across designators and communities that are eager to create a new culture within the Navy. With tremendous support from San Diego’s Basic Division Officer Course (BDOC), many other young officers took in the event, geared to spread the culture of creativity across the fleet. Beyond the Navy complement at Waterfront Athena, civilians from industry, academia and government joined in the action. In attendance, we had our old friends from the University of Southern California Institute of Creative Technologies, SPAWAR and Harris Corporation, but also new friends from Lockheed Martin, CUBIC Corporation, Navy Undersea Warfare Center,iENCON, NASA, GovAlert and more. It truly was an amazing network of thinkers, doers, dreamers and makers and made for our best event ever. 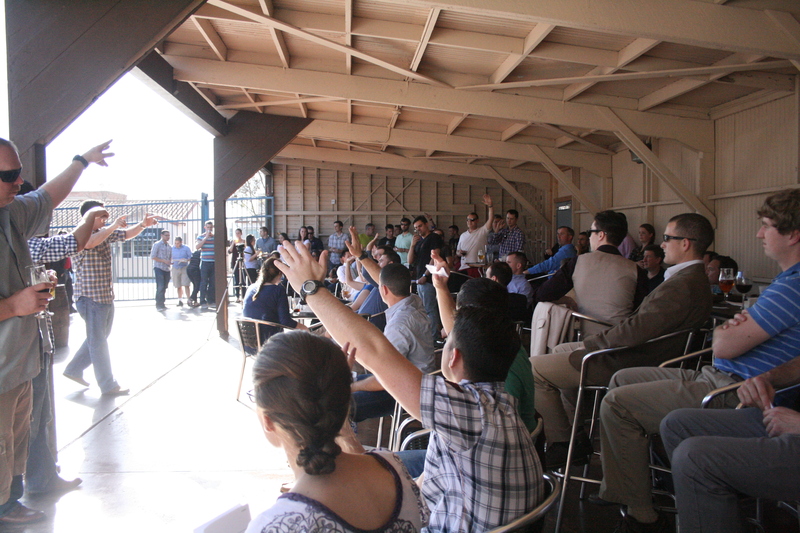 Some of the Waterfront Athena crowd, escaping the sun and listening to the pitches. In addition to the nine great ideas that our Athenians presented, the audience was treated to a halftime display of 3D printing and advancements in the development of LT Bill Hughes’ project from the last Waterfront Athena, CosmoGator, from Matt Reyes of the NASA Ames Research Center. Reyes showcased low cost solutions using additive manufacturing. And, just to show how quick and easy the system truly is, Reyes printed a iPhone 4 case on site. 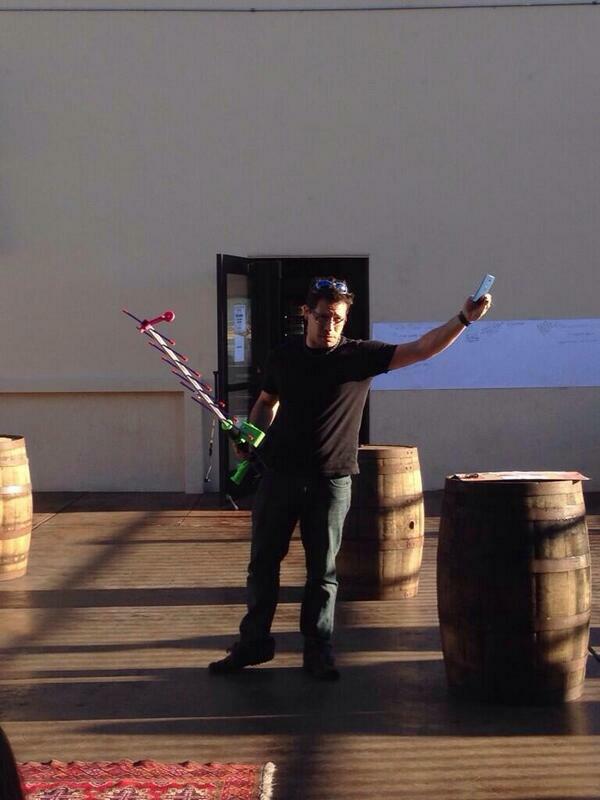 Matt Reyes showcasing a possible new direction for CosmoGator. While attending transition courses in preparation for the plunge into Corporate America, FCC Roberts became frustrated with the current catalog of tools that veterans could use to find the right job and decided to take matters into his own hands. He pitched a program, the Veterans Employment Transition Software (VETS) wherein the system is stood on its head: Instead of veterans finding jobs, the jobs find the veterans. In his vision, a veteran would input personal information and experience, and the VETS program, with participation from potential employers, would more efficiently pair up jobs with the seeker. Metrics like primary duties, collateral duties, education, sea/shore commands and performance evaluations would lend to smarter placement. To FCC Roberts, there’s no reason why our experienced military servicemembers should be confined to a job that didn’t suit them and allow them to use their unique talents to flourish. LTJG Wang, a three-time Athena presenter, partnered with entrepreneurs in the San Diego area to propose a smarter way to store critical parts and devices, prevent dangerous electro-static discharge and save money using new storage containers and reverse logistics. He proposed using demonstrated products and processes that have already saved many leading-edge businesses in today’s Fleet. Our Third Place finisher and Oregon State University graduate proposed a smarter way to heat the water that ships use. As currently designed, Navy ships are highly inefficient in the way they heat and distribute water throughout a ship. Almost 1,000 gallons of water are constantly heated and pumped through thousands of feet of piping waiting to be used, whether the crew is sleeping at home or washing dishes at sea. Baker proposed utilizing commercially-available “Flash Hot Water Heaters” to instantly heat water without the need for a water tank. These systems eliminate intrusive piping and save boatloads of energy, money, and maintenance man-hours. Engineers from iENCON immediately connected with Baker’s concept and began working right then and there on a plan for testing across the waterfront. A game-day entry, CMDCM Snyder proposed using visual recognition software resident on mobile devices to revolutionize equipment validations and parts replacements for shipboard systems. CMC Snyder considered naval application of this technology after watching his kids use image recognition applications. With more and more digital natives joining the Fleet, he sees fertile ground for Sailors to use their cameras to take a picture of a broken piece of gear, filter it through a local database to recognize the system and part, then forwarding the image to a shore-based or local site where the faulty part could be printed using additive manufacturing. In his vision, pictures of equipment could be catalogued and used to help ensure that maintenance men get the right part every time. The runner up for the Admiral Sims Award, ETC Lewisson proposed the use of the Army’s Multiple Integrated Laser Engagement System (MILES) for shipboard training. Currently, anti-terrorism/force protection drills are conducted using rubber weapons and generally have Sailors yelling “bang, bang!” at each other to simulate an engagement. ETC joked that this system was awesome on the playground, but doesn’t have a place onboard a warship. By using MILES, which is a super-whamadyne laser tag system, trainers and trainees would be able to assess multiple metrics, including shot count, accuracy and decision-making delay to improve overall training. Further, Lewisson said that the system would lend itself well to integration across training teams, such as medical, damage control and combat systems. The MILES system is already a program of record and as such, would only be marginally difficult to transition to the surface fleet, Lewisson said. Representatives from the CUBIC Corporation in attendance agreed with Lewisson’s vision and are already working to find a way to incorporate the system for shipboard use. An idea from a recent “Learn Warfighter Needs Workshop” at SPAWAR (you can read all about it in our summary here) GMC Zimmerman, in concert with FCC(SW) Barry Adams and SPAWAR Scientists dreamed up a system whereby watchstanders in a ship’s Combat Information Center (CIC) could make use of existing virtual reality technology and the ship’s optical sensors to assist in building a recognized maritime picture of all other surface ships in a warship’s vicinity. Todd Richmond of USC’s Institute of Creative Technologies and Josh Kvavle of SPAWAR joined forces with GMC Zimmerman during his pitch, lending the power of the brilliant minds at their organizations to Zimmerman’s lofty vision. Formerly of the aviation community, the newly minted Cryptologic Technician – Technical pitched the need to adopt innovations from the aviation side of the house to improve software integration as it related to maintenance, replacement part ordering, administration, training and more. CTT2 Nothnagel proposed one streamlined system on a mobile device to change the way maintenance is done in the Navy. Maintenance workers would have their lives simplified and it would allow for optimized tracking of maintenance hours and decrease the need for frivolous spot checks, Nothnagel said. The project caught the eye of CRICster LT Rollie Wicks who has been working a similar project on the East Coast for his community. The two connected and are working to find a way forward for Nothnagel’s idea. In her pitch, ET2 Johnson proposed teaching courses on logic to enhance Sailor decision making. Johnson, a two-time Athena presenter, proposed testing the effect of her concept on a single surface ship – measuring the improvement in Sailors’ logic skills prior to and following a series of instructional sessions on the discipline. If successful, Johnson would pursue earlier implementation of the courses, in basic training for enlisted Sailors and officers alike. Teaching logic to Sailors would not only assist them in tactical and operational-level decision making, but also off-duty decision making, potentially reducing the number of destructive decisions that can sometimes plague junior Sailors. Last but not least, the Admiral Sims Award for Intellectual Courage goes to regular contributors to this blog and Waterfront Athena Events, LTJG O’Donnell and LT Nobles. The pair proposed starting a website-based system that would serve to connect Sailors and Scientists to build a foundation of knowledge between the two sides, bridging knowledge gaps and fostering new networks and alliances. After a hugely successful “Learn Warfighter Needs Workshop” between SPAWAR and USS BENFOLD (DDG 65) wherein Sailors and Scientists connected through learning, design thinking and ideation. The Admiral Sims Winners! PartnerShips! With such a strong event, the two officers developed a way to lay a base-coat of continuous learning between the two sides, and proposed that the growth of familiarity could potentially lead to incredible ideas and increased job satisfaction. 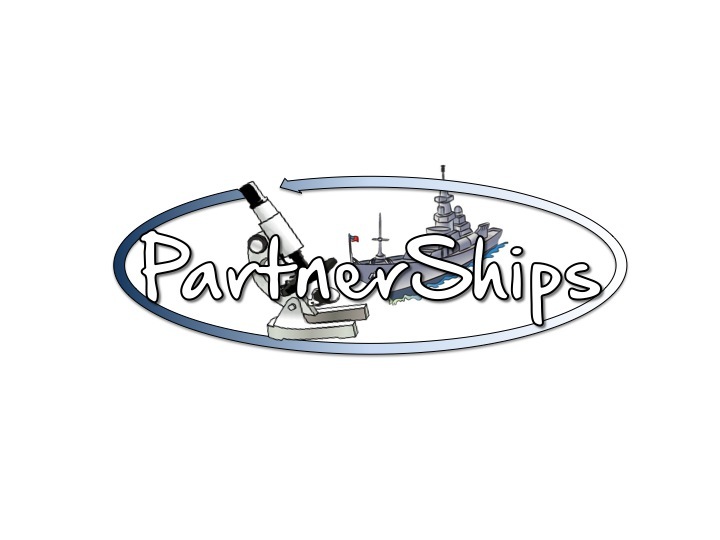 On the proposed website, a Sailor or Scientist would fill out a survey with questions on experience level, education and interests, and the PartnerShips team would link up users for a professional “pen pal-like” relationship. Over the course of the PartnerShip, the two parties would host monthly tours, exchange weekly e-mails and eventually attend join-ups to strengthen ties, all while feeding their experiences back to the PartnerShips homepage. The two did not waste any time waiting for the site to be built, though. They had signup sheets for Sailors and Scientists that were interested in the program to fill out on site. In the initial salvo, over 20 innovators signed up! At The Athena Project we’re constantly humbled by the support that our initiative has received both from the fleet and from industry. It’s amazing to think that what started as an unfortunately-named experiment called WikiWardroom has blossomed into a stage for Sailors to have their voices heard by tremendous companies and makers from across the private sector and academia. Thank you to everyone who participated in this event and we can’t wait to see you guys at our next one! If you can’t make it out to San Diego, then break down some doors and start an Athena Project of your own! We’re more than happy to help any organization that wants to use the Athena construct as a means to slingshot ideas into the stratosphere! Stay tuned – We aren’t stopping anytime soon and we’ve got some big plans coming for Athena to help further build the growing wave of creativity in the Navy! Connect with The Athena Project on Facebook: www.facebook.com/athenanavy or follow us on Twitter: @AthenaNavy. Interested in starting a movement of your own? Message us, or e-mail ATHENA@ddg65.navy.mil!